We are seeking individuals who are goal-oriented and operate with high levels of urgency and personal responsibility for achieving ambitious outcomes; thrive in achievement-oriented, entrepreneurial, and fast-paced environments; have a strong belief in the power of high expectations on achievement; and are passionate about reducing the educational achievement gap, the poverty and improve the living conditions in our Bunyoro-Kitara Kingdom. Social conscience, reliability, honesty, loyalty, commitment, truth, justice, peace and conscientiousness. Good network in various institutions, organizations, etc.. The absolute will to achieve something for the Banyoro and improve the living conditions. Absolute readiness to Teamwork, mutual support and offering of assistance. Readiness for punctual legwork even in substantive section of the plan and specialized cross-cutting projects. Realize more than you have promised. 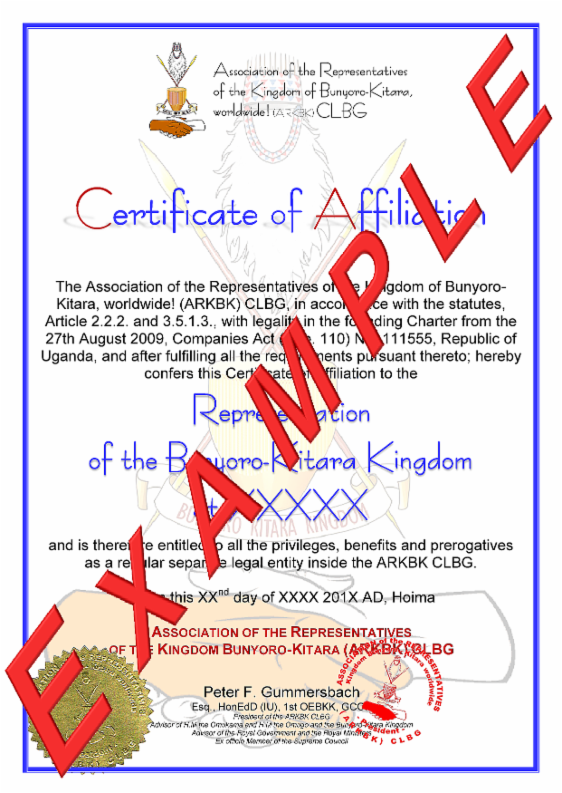 This is a voluntary activity for the Kingdom Bunyoro-Kitara are context of development aid. There exist no legal claim for this voluntary activity for any possible honours of the Kingdom. The royal prerogatives, privileges and rights can not to be sell or sold. 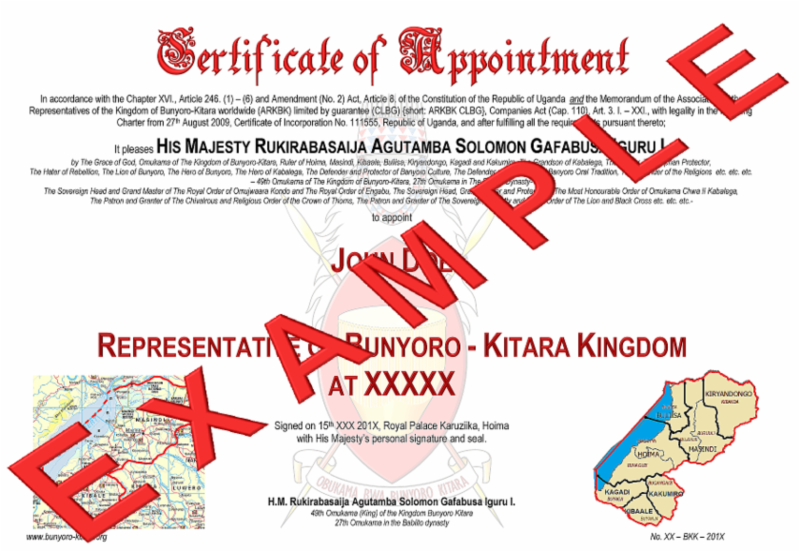 No person can apply for royal honours, this are one and only the decisions of H.M the Omukama (King). It does not concern here an activity according to the Viennese convention of 1962 and 1963 (consulate or embassy). Representative are "Representatives" they enjoy no immunity. For each position there is a position description. The activities are coordinated by the representatives in a state. The respective projects and achievements must be submitted by the representative of the Kingdom in the state to the president of the ARKBK CLBG. Each representative of a state is indicated by HM the King to the respective Ministry of Foreign Affairs and Ambassador to the country. 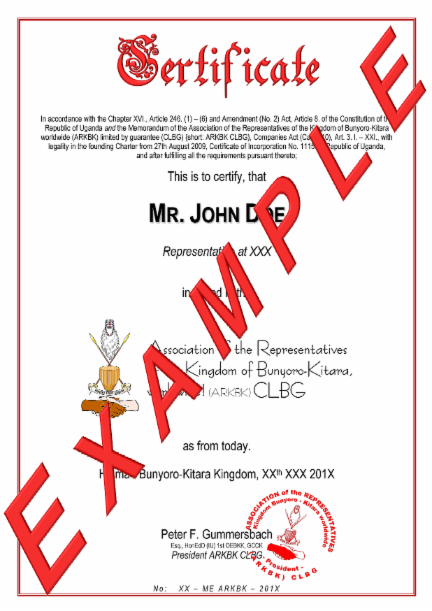 Furthermore, the representative of a country will be included in the ARKBK CLBG by H.M the King or the president of the ARKBK CLBG. *Documents to pass an inspection. These are automatic disqualification criteria for candidates! False or fake awards / honors / orders, etc. 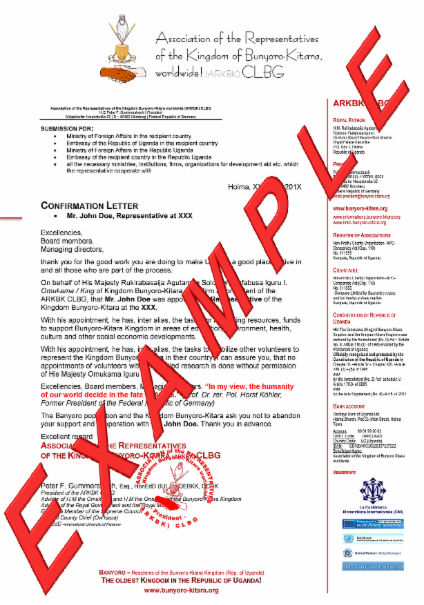 Membership in universities, institutions, educational institutions, etc. which do not have accreditation from government agencies. Intrigues which are not allowed by the national law. Membership and / or connection to shady organizations. Negative entries in the police certificate/clearance. Injuries of international law and human rights. Part/Membership at self-styled orders or false chivalry. Involvement and/or a part at sects.